Everywhere you go, businesses are closed. Some are closed for the whole month, some for a week or two. 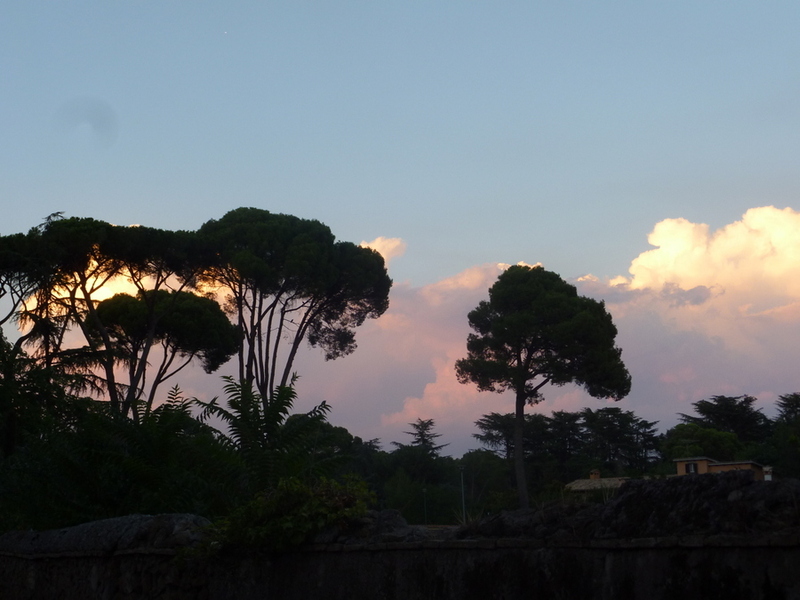 Every blogger seems to be writing about Ferragosto, the heat, and the Italians fleeing the city. Lacking a family casa al mare (house by the sea) we are, of course, here working. And this city is indeed a strange place this month! 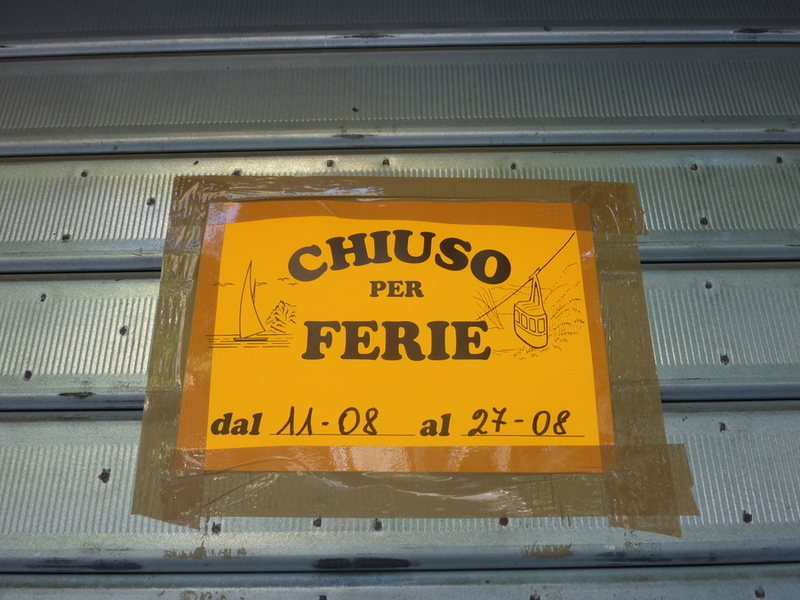 Ferragosto is the Italian late-summer holiday introduced by Emperor Augustus, now a big family day (think beach, lunch with Grandma) and also a religious day, The Feast of the Assumption. Many people build a vacation around it, much as Americans would do around Independence Day. 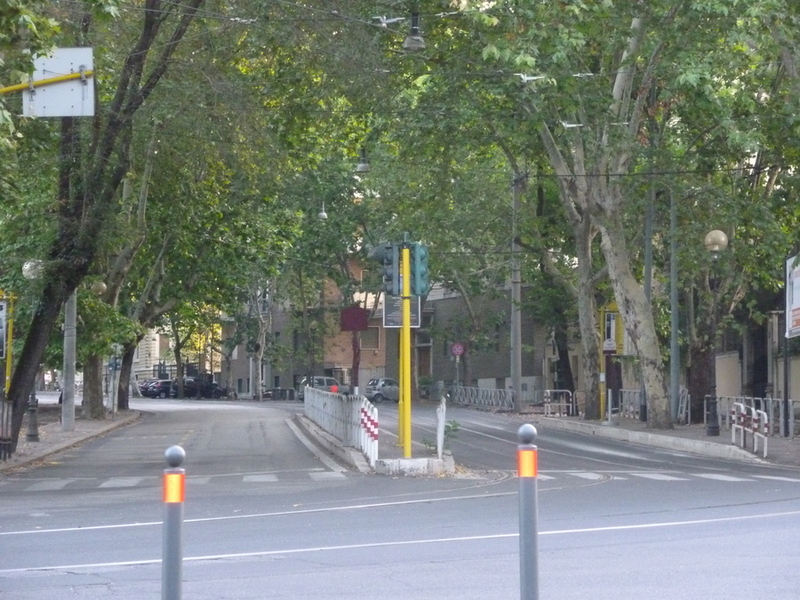 7:00AM – There should be trams, a bus or two, several motorini, and dozens of cars. Niente this week! 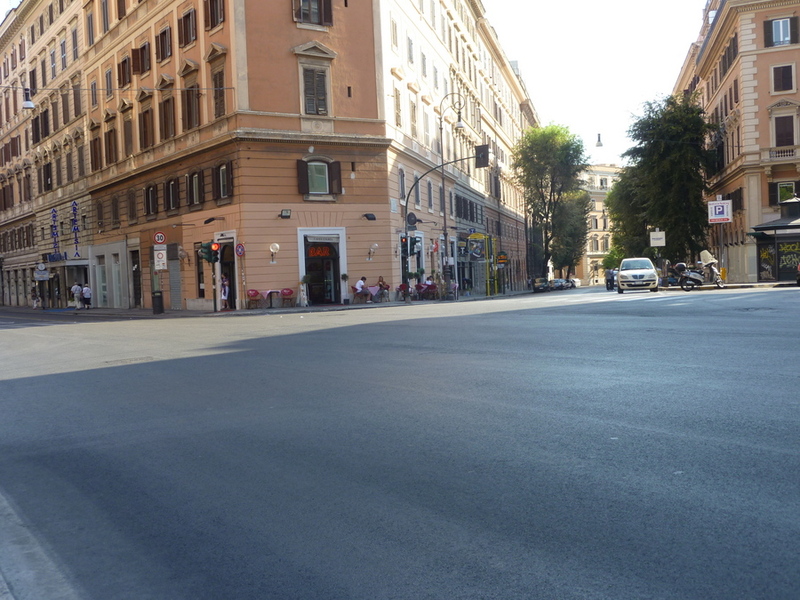 There’s little or no street construction, so noise is reduced considerably. Many apartments are empty and we hardly see any lights on at night in the neighborhood. Portieri (building superintendents) are on duty all month to provide extra security for vacant apartments. At lunch, you might have to hunt around for a small cafe to even find a sandwich. Some grocery stores shorten their hours or close for a couple of weeks to remodel. We also hear evidence of some indoor remodeling work as apartment owners have projects addressed while they are on vacation. At the office the phone doesn’t ring, there’s less mail, few visitors, and meetings are cancelled for lack of attendees. In the evening, there’s a sense of desertion. It’s eerie in a Zombie-Apocalypse sort of way. Buses still run, but some are less frequent. One part of the Metro is shut down for renovation. Why not? Ridership is down. So what if tourists are confused? It will reopen in time for back-to-school-and-work. Summertime and the parking is easy! 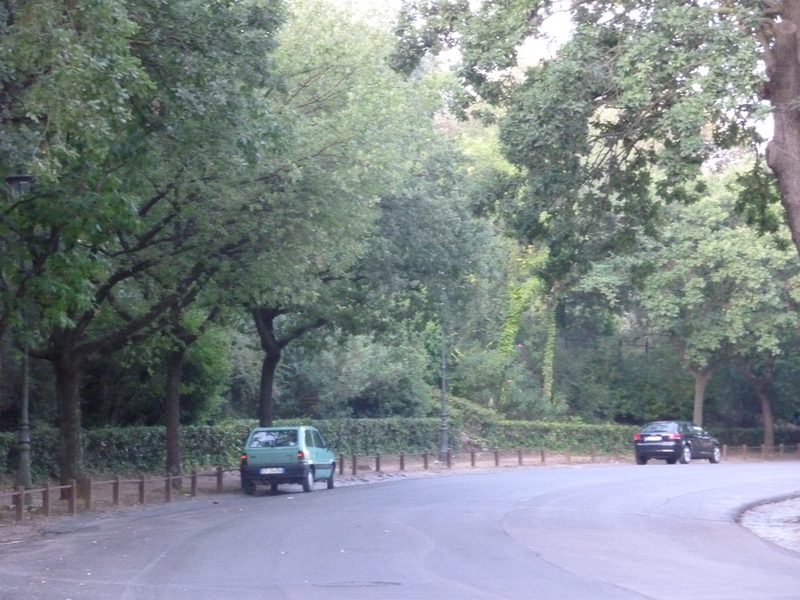 Usually filling up with commuters when I walk through, this street is in Villa Borghese. The dogs playing in the park have disappeared and the joggers are few. 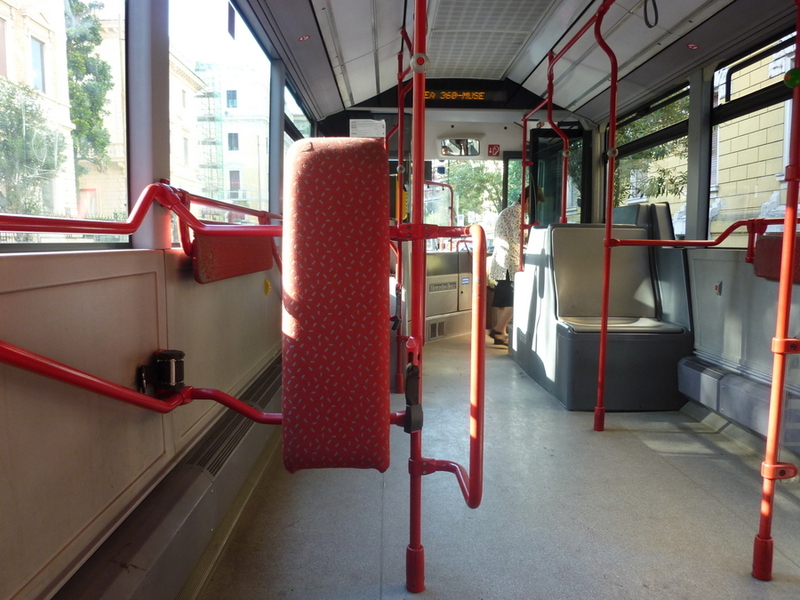 Except for major tourist areas, the buses are almost deserted and on schedule. Usually I have to stand on the way home, at least until the last few stops. This week, I not only get a seat, but I am the last one on the bus for almost half the trip. We were kind of dreading August: the heat, the stories about closures and inconvenience. However, I think I am going to like August here. And sometimes we get marvelous thunderstorms! So good to hear you are happy and adjusting . The month of July was the wettest on record, August has proven to be supper hot, high 90’s and some triple digit days. My work at the salon has been good, hope it will carry through to Fall. I have forwarded all your blogs to Dan Jossi, he asks about you. If you would like his email, let me know. Sounds like you are already planning for the ” Holidays ” and where you might be spending Christmas. I ‘m sure Rome can offer a great deal for the special season. Thanks for the update Mary! One of these days I am going to do a post on pedicures. Not the same experience here! I miss you, too. Love hearing about your adventure. We have been enjoying our hot summer. Been getting a lot of camping and boating in. What a glorious thing to experience, heat and all. Gives you a chance to regroup a bit in the office – always a good thing! After three days of 100 degree weather, this morning it is 65 and light showers with the promise of thunderstorms this afternoon. Woooo Hoooo!